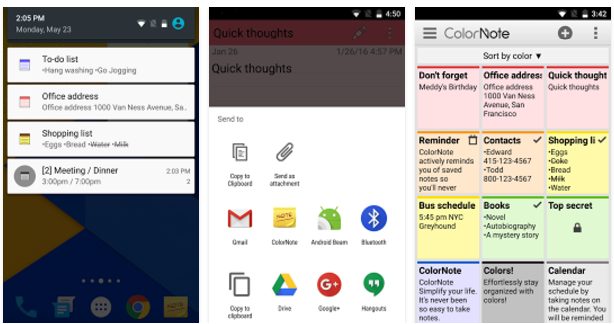 If you are looking for a good Google Keep alternative to use on your Android ColorNote is definitely worth trying. This is a free notepad app that provides you with a simple notepad editing experience to write down your notes, to-do lists, reminders, emails and memos. ColorNote has two note taking formats: a lined-paper styled text options and a checklist option. The text option allows you to add as many notes as you want. You can easily edit your saved notes, share them with others or delete them. You can also use ColorNote checklist mode to create to-dos. You can add unlimited number of items to your list and once it is saved, you can check or uncheck your items with a single tap. Other interesting features provided by this app include: organize notes by color, protect your notes with a password, write a diary and journal in calendar, search notes and memos, organize your schedule by note in calendar, share notes via SMS or email…and many more.